Today’s raw drawn talisman was inspired by my Artist’s Way morning pages. The area we’re exploring this week is the false beliefs we have about our creative work and where those come from. 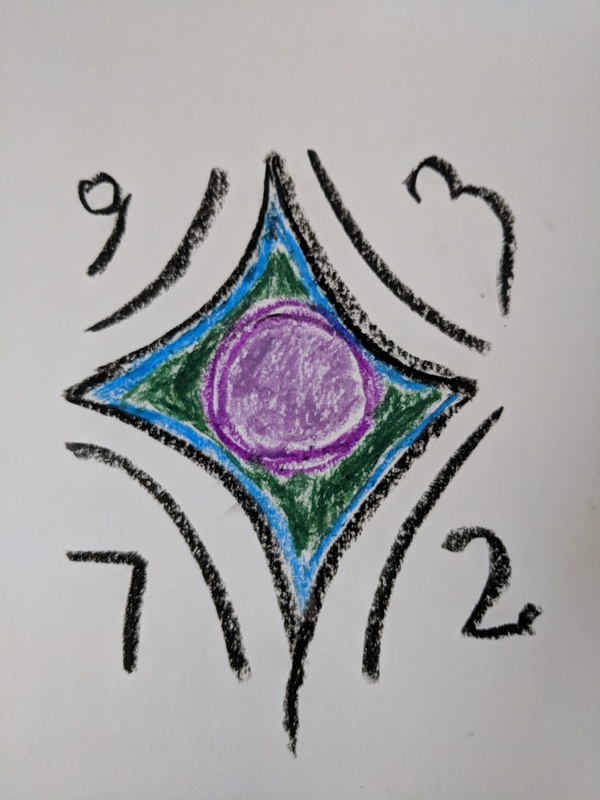 So I was inspired to create a talisman that recovers creative power away from those self-limiting beliefs and the naysayers who implanted them. The talisman is activated whenever these things/people rear their ugly little heads. It feeds off of that negativity and transforms it into creative energy. The purple is the well of personal power, surrounded by a green barrier (creative energy), which is surrounded by a layer of blue for wisdom and emotional strength. The black and the symbolism are the wards against anything breaching this. Mind you this is just the rough sketch. I’ll be creating the talisman more permanently via another medium probably. I’m only sharing my sketches during #DoMagick and not the actual artifacts for my own reasons. This entry was posted in magical artifacts, Magick and tagged talismans by Steph. Bookmark the permalink.